Look for next week's roundup at Will Work for Favorable Dicta, then it's back here the week after that. You can find some other recent roundups in the "At the Law Schools 2" category, and sixty or so older roundups from 2004-2005 here. THE ILLINOIS BAR JOURNAL TAKES A LOOK AT LAW-RELATED WEBLOGS . . . Weblogs are on the cover of the Illinois Bar Journal's May issue in "Do We Blawg and How," by Helen W. Gunnarsson. You'll find lots from law-related webloggers in Gunnarsson's article, including Judge Richard Posner, Denise Howell, Matt Homann, Dennis Kennedy, Cassandra Crotty, Steven Jakubowski, Peter Olson, Joel Schoenmeyer, Jeremy Richey, Ernest Svenson, Larry Ribstein, Linda Beale, Lawrence Solum, and me. Gunnarsson's article is a great resource for any lawyer who's new to weblogs and is wondering what all the fuss is about. Highly recommended. UPDATE: Oops, it appears that the link to the article, which works for me, only works because I'm a member of the Illinois Bar. I thought the article was generally available because I got to it without entering a password, but the site must have been reading a cookie. I'll do what I can to fix the situation. UPDATE 4/30: The link should now be working. Thanks to the Illinois Bar for working on the problem over the weekend. TIKI BAR TV AND LAWYERS . . . It was in Blawg Review #38 (the one about weblogging and how I do it) that I mentioned that I can't get enough of the videoblog Tiki Bar TV. While I admit it's an acquired taste, no self-respecting lawyer should miss Episode 15, wherein the cast fixes a broken legal system with a drink called Out of Court Settlement. Why Rolling Stone didn't mention Tiki Bar TV in its article "The Rise of the Video Blog," I don't know. Is it too weird for the masses? Maybe, but from what I understand, the masses like it pretty much. For example, it's one of the top video blogs on i-Tunes. Not an easy thing to do . . .
UPDATE: Wikipedia's entry on Tiki Bar TV. AT MY TRIAL PRACTICE WEBLOG . . . "Practical Advice for New Lawyers from a Curmudgeon." 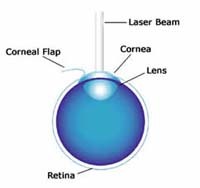 *Risks of LASIK eye surgery include loss of vision, anisometropia, epithelial ingrowth, flap melt, aniseikonia, double vision, hazy vision, fluctuating vision, glare and haloes, undercorrected or overcorrected vision, dry eyes requiring use of punctum plugs to reduce tear drainage, corneal ulcer formation, endothelial cell loss, ptosis, and much, much more. Well, my last post generated quite a lot of comments and interest, so I feel obliged to follow up in one particular area. Ted at Overlawyered thinks my analysis of what constitutes a "frivolous" lawsuit is fallacious (he called it "sophistry," which has a bit of an ouch factor to it), but I think when we're talking about something as important as restricting access to the courts, we need to know where one's starting point is. Hence, I defined what I think constitutes a frivolous lawsuit as "one that gets dismissed, either by a motion to dismiss because it doesn't state a claim, or on summary judgment because there's just no relief available under the law." I stand by that definition, and here's why. 9/11 FAMILIES REQUEST GOV'T DOCUMENTS, GOV'T SAYS NO: IS IT REALLY ABOUT SECRECY? . . . In the Zacarias Moussaoui case earlier this month, U.S. District Judge Leonie Brinkema ruled that famlies suing over 9/11 in a civil case should be granted access to the government's case files against Moussaoui. Before she ruled, Brinkema said, ""It is amazing what some agencies think is secret. As a culture, we need to be careful not to be so wrapped up in secrecy that we lose track of our core values and laws." The 9/11 families are represented by Ron Motley, the asbestos and tobacco lawyer. Motley told CNN, "We have not asked the government to give the 9/11 victims one single thing they didn't provide to Moussaoui's lawyers." Though both sides are debating secrecy, the government's main concern is probably something else. More likely, it's a desire to obstruct Motley's lawsuit. At last count, Motley was suing 105 defendants for allegedly financing Al-Qaeda, including large Middle Eastern banks and wealthy Saudi individuals and corporations. As Overlawyered once noted, "The U.S. government has been highly critical of the freelance use of private litigation to second-guess the state of U.S.-Saudi relations." Meanwhile, Motley's own stash of secrets might very well equal the government's. Working on the case, Motley and his staff have amassed "the world’s largest free-standing database of intelligence on Islamic terrorism." See UK Times, "Breaking the Al-Qaeda Code." Motley did it large with his own money, spending more than $18 million to purchase intelligence information from around the world. It may not be long before the government is seeking access to Motley's files, not the other way around. 1. "Ron Motley's 9/11 Class Action: Following the Money Trail"
2. The Legal Underground Podcast Episode #39 (An inside look at the 1999 law drama "The Insider," with a focus on plaintiffs' lawyers Ron Motley and Dickie Scruggs). FAILING TO TAKE WEBLOGS SERIOUSLY: HOW I FAILED TO SPOT A TREND . . . As a guy with a couple of weblogs, it might seem like I'm pretty hip to the blogging movement and all, but the truth is I'm still stuck in the 20th century. My problem is that I just can't seem to take blogging as seriously as everyone else. Case in point: When law professors starting to get all exited about weblogs a few years ago, what did I do? Did I congratulate them for their ambitious vision? Did I commend them for their embrace of new technologies? Did I jump on their bandwagon? No, I mocked them, more or less, with a post: "Law Professors: Blog Your Way to Tenure." Boy, was I wrong. The law-professor-blogging-movement has taken on so much steam that they're holding a conference about it tomorrow at Harvard: "Bloggership: How Blogs are Transforming Legal Scholarship." It's an opportunity for them all to get together and study "the impact of blogs on the legal academy." I read about it at Althouse. You can even rub elbows with a bunch of the participants who will be hanging out together in the same room (and posing a serious threat to the law-professor-blogging phenomenon should a meteor strike): Randy Barnett, Howard Bashman, Douglas Berman, Paul Butler, Paul Caron, Michael Froomkin, Eric Goldman, Gail Heriot, Christine Hurt, Orin Kerr, Peter Lattman, Jim Lindgren, Betsy Malloy, Ellen Podgor, Larry Ribstein, Gordon Smith, Dan Solove, Larry Solum, Eugene Volokh, and Ann Althouse. Not all of those luminaries are law professors, but it's still quite a list. I wish them luck as they get together at Bloggership to discuss "the role of the law professor blogger" and "the many faces of law professor blogs" and "law blogs as legal scholarship." I hope they remember that if anyone tells them that a blogger is just a writer with a cooler name, they should distinguish that statement on its facts--"Yes, except we're law professors. We're more than just writers. And now we're the uber-bloggers." It's true. Law professors are the uber-bloggers. Not only do they have the best conference locations, but they also get the most law-blog traffic. I officially stand corrected. UPDATE 4/28 Professor Althouse is live-blogging the conference. AT MY TRIAL PRACTICE WEBSITE . . . "So You Can't Think of a Reason Law Libraries Are Useful?" April 27, 2004: "'Ordinary Blog Day': A Discouraging Recap of a Failed Experiment"
April 29, 2005: "Advice to Young Lawyers #29 (should I kill my litigation adversary?)" If you'd like to browse the archives on your own, please be my guest. You can look on the Greatest Hits page, browse by category, or look in the monthly archives that are towards the bottom right of each page. You'll also find more navigational advice at the Help Desk.